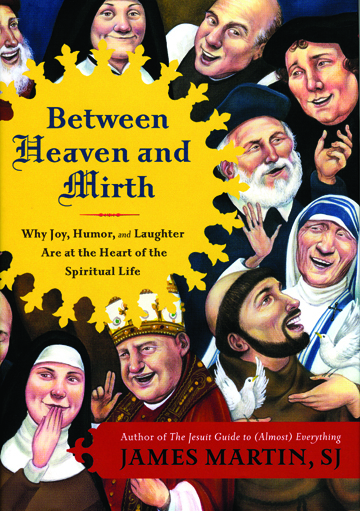 Between Heaven and Mirth by Father James Martin, S.J. The old Baltimore Catechism set us straight right off the bat in first grade. The answer to question number four: “God made me to know Him, to love Him and to serve Him in this world and to be happy with Him forever in heaven.” In plain words, life is serious stuff; the happiness comes later. Not all the saints would agree with this interpretation, and would argue life can and should be joyful in this world too. “Although the Gospels clearly show Jesus as clever and articulate, especially when it comes to His parables, there are few moments in the New Testament that strikes modern-day readers as laugh-out-loud funny,” Father Martin admits. One of the things some biblical experts suggest is that events that might not seem funny to us would seem funny to Jesus’ contemporaries. That would be almost impossible to prove and may be a stretch. And in fact the Gospels do give a hint that Jesus was a joyful person, none better than choosing the changing of water into wine as His first public miracle, and as Father Martin treats at length, the humorous story of poor little Zacchaeus, who had to climb a tree to see Jesus. More than counterbalancing this are the prelates and saints who look upon the sunny side of life.